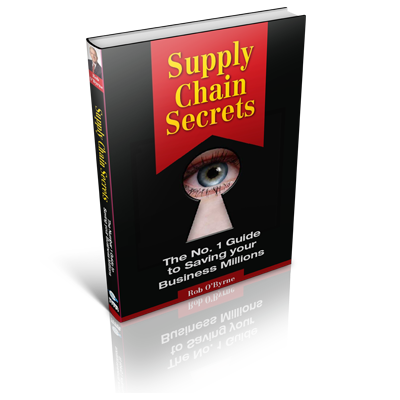 This book (one of a series) provides some valuable tips and insights across a wide range of Supply Chain elements and is the first of a series that is likely to extend to over 10 books in the next 2-3 years! Rob O’Byrne gives his powerful and essential tips and insights based on over 1,200 client assignments across 22 countries. This book shows you how to find the greatest potential for massive savings and increased bottom line. How to access the big ticket items to reduce costs. 5 critical Tips on measuring for superior performance. Balancing cost and service for more effective distribution. How to stop inventory investment blow outs. 3 key steps to developing a game winning Supply Chain strategy. The 5 key steps to improving warehouse effectiveness. Avoiding the stuff that screws your supply chain performance. By filling out the form below to download a free book chapter, we’ll also keep you up to date with; news on the upcoming books in the series; a free email newsletter full of further great tips and free invitations to our popular supply chain events held around Australia and SE Asia that are valued at well over $1,200. These events are hosted by my consulting company Logistics Bureau and have been enjoyed by thousands of senior Supply Chain and Logistics professionals over the years. Look out for the other books in this series. If you want to engage with other Supply Chain Professionals online, you might want to check out Supply Chain Forum.